(PhysOrg.com) -- Scientists are for the first time studying a speech therapy technique called Melodic Intonation Therapy to find out what happens in patients’ brains. The therapy is used to teach people who have aphasia (inability to speak) after suffering a stroke to speak, and makes use of the fact that many people who cannot talk can still sing. WASHINGTON — For those who seriously practiced a musical instrument when they were young, the experience was more than just entertainment. Recent research shows a strong correlation between musical training for children and certain mental abilities. The research was discussed at a session at a recent gathering of acoustics experts in Austin, Texas. Laurel Trainor, director of the Institute for Music and the Mind at McMaster University in West Hamilton, Ontario, and colleagues compared preschool children who had taken music lessons with those who did not. Those with some training showed larger brain responses on a number of sound recognition tests given to the children. 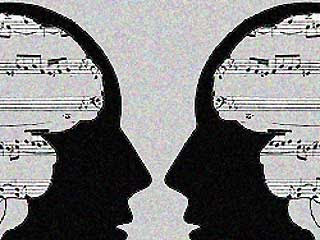 Her research indicated that musical training appears to modify the brain's auditory cortex. Few people over the age of 10 would list "Happy Birthday" among their favorite songs. But Harvey Alter, now 62, has a special fondness for it. It helped teach him how to talk. One morning in June 2003, Alter, then a self-employed criminologist, was putting a leash on his dog, Sam, in preparation for a walk when suddenly he felt dizzy and disoriented. "My thoughts were intertwined, not making sense," he said in a recent interview. "I knew I was having a stroke." At St. Vincent's Hospital, doctors diagnosed an ischemic stroke, caused by a blockage in blood flow to part of the left half of his brain. 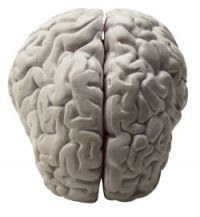 As a result, the right side of his body was temporarily paralyzed, the right side of his face drooped and he had trouble coming up with the right words and stringing them into sentences - a condition called aphasia. Within hours of his stroke, Alter met with Loni Burke, a speech therapist. At first he was completely nonverbal; within a few days he could say small words. "Mostly, he said, 'No,' " Burke recalled, "because he was frustrated that he couldn't speak." Sometimes the spark that ignites a new area of scholarship happens in the classroom, sometimes it happens in the field where research is conducted, and sometimes it happens at an academic conference or symposium. 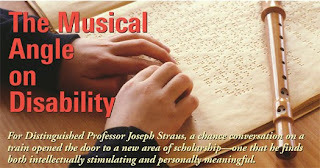 In the case of "music and disability"—an emerging subfield of musicology and music theory—it happened on a train. Listen up: belting out tunes in the shower may not only be music to your ears, but may also treat a variety of disorders such as Parkinson’s disease, aphasia and dementia. In fact, singing has both physical and neurological benefits, according to a CNN article in which Dr. Wendy Magee, International Fellow in Music Therapy at the Institute of Neuropalliative Rehabilitation in London, described music as a “mega-vitamin for the brain” that can improve a host of condition Next..